Last week Paul Howes hailed himself as the Messiah. He told the Press Club he'd found a new way to paradise . . .
Only one problem. He hadn't run the blueprint past 'mate' Bill Shorten first. Guess what. It won't happen. This article in the Canberra Times pointed out why . . . The media isn’t perspicacious. We’ll take people pretty much on their own assessment. Sometimes, of course, this results in us assuming some people are more important than they really are, particularly when their evaluation of their power doesn't mesh with reality. Which brings us to Paul Howes. Most people can remember when Bill Shorten burst onto the political stage. It was at Beaconsfield, Tasmania. He performed a vital role, an intermediary between the families of the miners trapped down the shaft; their families; and the rescue effort. Young, personable and articulate, Shorten was exactly what you'd want your union leader to be. He was the right man in the right place at the right time. He's parleyed that initial success into a remarkable political career and seems to have kept that knack of being in the right spot. He occupies a safe seat; has successively acted as the key figure in the destruction of two Prime Ministers; installed himself as opposition leader (despite the preference of the rank and file for someone else); and is now, remarkably, doing better in the polls and any previous opposition leader at this point in the electoral cycle. There’s something about Billy. Now you may not have noticed at the time, but there was another, slightly younger bloke supporting Shorten while the dramatic events at the Beaconsfield unfolded. That was Howes. He had a lot in common with his boss, not least ambition and an instinctive grasp of the way politics works. But there was much that was different, too. Shorten attended Xavier, an elite Melbourne GPS school, headed off to Monash university to study Arts/Law and aligned himself with the Labor right before taking an MBA at Melbourne Business School and taking over the AWU. Howes, adopted, left Blaxland High at the age of 15 (he still hasn’t finished Year 9) and joined the far-left Socialist Alliance. He didn’t last as a bank-teller and wound up working for Shorten, who picked him up as a supporter. Although there were a number of issues they didn’t agree on (Howes was far more comfortable placing himself on the controversial, unpopular, side of an argument - such as being stridently pro-nuclear and vocally pro-Israel) the two became strong allies, although always with Shorten in the van. He later moved on to a stylish new wife and a glorious political career. Howes also found a new partner while guarding his mate’s back. He slipped into Shorten’s role as head of the AWU when his mate moved on. This was how he arrived on the political scene. On the night Julia Gillard was tearing down Kevin Rudd Shorten was busy working the phones and assuring parliamentarians the sudden coup that came from nowhere was both necessary and inevitable. But it seems he’d forgotten that he might need to square-up the people of Australia, too. And that’s how Howes proudly took on the mantle of the ”faceless man". Howes went on television purporting to be the unheard voice of the workers. He explained (although no one outside the party had any inkling of this until that moment) that Rudd was tyrannical and everyone had suddenly slapped their foreheads and said, "we've got to get rid of this bloke". His performance was so convincing that he followed it up with a book, purporting to represent his ‘confessions’. Howes enjoyed the limelight, but it was about this point that the split between the two appears to have begun. Howes was keen to follow Shorten into Parliament and there was a vacancy coming up for a New South Wales Senator. He launched a bid for the seat, but instead it went to another back-room operator Sam Dastyari (who later did the behind-the-scenes work to knife Gillard). Her political execution appears to have caught him flat-footed. He was one of her small band of supporters at the Lodge that night, commiserating with the former leader. Perhaps the all-points bulletin that she had to go hadn’t reached him. The point is, Shorten had read the mood of the country and changed but Howes hadn’t. That didn't matter to the younger man. He was confident and the media continued to insist he was a popular and powerful representative of the new-style union movement. Last week Howes tried to establish his leadership credentials by marking out a new direction for Labor. His Press Club speech represented not merely a challenge to the old orthodoxy, but an assault to Shorten. It was an attempt to position Howes above the political fray, representing the best interests of not merely the workers, but the country. He was marking out ground and recognising the reality: a new political path has to be followed if the country is going to succeed in the new economic reality. But there was a problem: this time he was on his own. His ideas may have been interesting but they flew in the face of Labor’s leader, who doesn't want to hear about “compacts” between the workers and the Liberals. Business isn't interested either. The bosses realise the union movement is on its last legs. The last thing they want to do is give it any sort of larger, relevant role in representing workers. 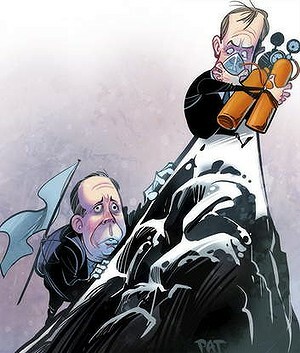 Tony Abbott gave the idea oxygen for a moment, but his aim was simply to stoke dissension and conflict within Labor. Howes likes to position himself as a maverick. That's fine and we need a few. Nevertheless, outsiders rarely make it to the peak. Instead they become defined by their opposition to the status quo. They don’t reach the top. I suspect that’s something Howes would like to do, but unfortunately for him Shorten’s making one thing very clear. The job’s taken.